Operating Era: 1915-1975. Pennsylvania RR, Huntingdon & Broad Top, Vandalia RR. Delivered beginning in 1915, the G22's were part of Pennsy's second fleet design of the twentieth century - an all steel fleet. The 46' long gons were delivered in two designs: the G22 with four clamshell bottom doors and fixed ends and the G22a with tight floor and drop ends. Of the 6,150 cars, 67% were G22's and 33% G22a's. All were lettered for Lines East and West except for 50 assigned to Vandalia Line. Beginning in 1926 most cars had their bottom doors removed, although some with bottom doors lasted into the 1950's. In 1930 some of the converted cars were given 100-ton trucks, creating the G22B class. These were used to carry bulk cement containers. G22's ran into the Conrail era in MOW service. 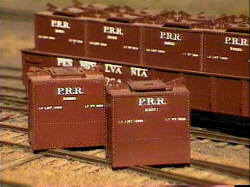 PLEASE NOTE: The #1290 Container set is discontinued as the decals are out. If there is enough demand for the Kit, We can reprint the decals.